Wedding is one of the most joyous and memorable days of one’s life. But planning and preparing for the day is the most stressful task. With almost everyone having a picture perfect wedding these days (or it appears so on Instagram), the pressure is even more. The couple has to thing about a zillion things from guest lists to floral arrangements to catering to dance choreography to a lot more. So to help you out, here is a list of top wedding resorts in Mumbai for your D-day. The perfect destination for a big fat Indian wedding, Lakeside Chalet is a gorgeous hotel for all your upscale amenities. The Powai lake facing resort has poolside, indoor as well as outdoor areas to accommodate all your needs. Wait there’s more! Beautiful apartments with wooden furnishings and marble flooring, a soothing spa to rejuvenate, a delectable menu in the restaurant which serves Italian, Thai, Continental and Chinese cuisines and a gym to workout. Known for its unrivalled service, this resort sure is one of the best resorts in Mumbai. Located right next to the airport, the Lalit is sure a perfect pick if you want luxury with convenience. With over 300 rooms and suites this is Mumbai resort is great if you have a huge guest list. There are 4 different restaurants, several huge dining areas and party halls, a night club, and a shopping gallery. The eye candy interiors and the magnificent infrastructure are bound to make your guest drool. For all the beach lovers who want to say their vows in the backdrop of the waves and golden sand tingling beneath their feet, this is your perfect resort. Foreseeing the Aksa Beach, this Mumbai resort is one of the hyped ones which provides picturesque sunsets for your wedding celebrations. There are different type of rooms to accommodate your guests, ranging from beach facing to garden facing deluxe rooms to villas and suites. The aristo spa offers some reviving therapies and several wellness activities. They have over 10 halls and banquets for including all your ceremonies and choreographed event management for functions like bachelorette parties and sangeet. Spread across 12 acres of land, this Mumbai resort is perfect for a low key hideaway kind of wedding which is far from the humdrum of the city life. Relax and recharge while you celebrate the best day of your life with your soulmate. The decor is just breathtakingly beautiful with elegant lighting, intricate floral arrangements, crystal details and quirky elements added to amp up the chicness. They also master in multi tier wedding cake, which you must order from here itself. The decor team is what sets this mumbai resort world apart. From arranging mehendi artists to building a super drool-worthy canopy styled mandap, there is nothing which the decor brigade can’t do. They have successfully organized quite a few high-end weddings till now and you can see for yourself in their catalogue. 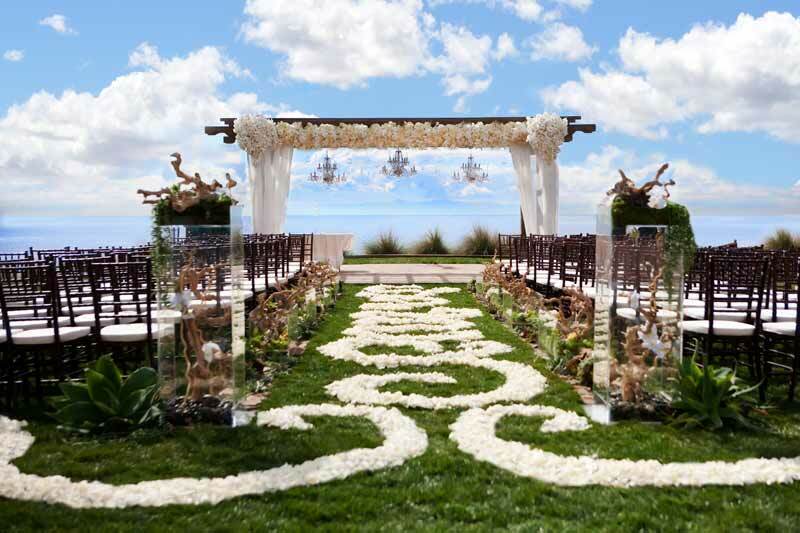 The lush green wedding lawns are to die for and are perfect to host an afternoon mehndi ceremony. The catering team is quite skilful as well. An amalgamated dishes of varied number of cuisines can be curated for your menu, including Thai, Chinese, Continental, Italian and Asian. The classy decor, carpeted floors, ceiling high pillar decorated with beautiful floral arrangements are key highlights of eskay resorts. A poolside bachelorette party or a musical night for sangeet gets quite lit, thanks to the event management team here. You can incorporate several themes for different celebrations and live your dreamy wedding that you have been waiting for since you were a kid. The small grove with ample trees can work out well for you if you want a refreshing open air styled wedding in the woods. Best suited to accommodate a big fat Indian wedding, this resort in Mumbai is quite popular among the celebrities. Be it a tranquillity filled beach themed wedding by the Arabian Sea or a cozy in-house themed overnight wedding, Ramada Plaza has ample space to accommodate all your needs. It can amp up any celebration to a 5-star or 7-star experience based on your interest. The valley styled resort with impeccable service and dining experience will sure win your hearts for good. The bookings have to be done quite early as it tends to get full pretty quickly.